First line: In my first year as a junior doctor I moved into lodgings in a small court close by Fleet Street, an area which could not at the time have changed greatly since the days of Dickens. 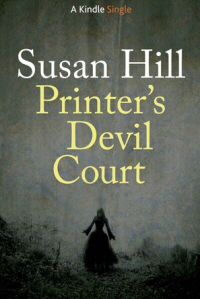 Part of the Kindle Single series (and irresistibly priced at 99p), Printer's Devil Court is a brand new short story from Susan Hill. In the tradition of her well-known historical ghost stories, the most famous of which is The Woman in Black, it's a spooky, atmospheric tale set predominantly in early-twentieth-century London. Against a backdrop of impenetrable fogs and bleak winter storms, a young trainee doctor becomes unwittingly involved in a devilish scheme devised by two of his acquaintances, which will come to haunt him for many years afterwards. Despite its extreme brevity, I found this tale more fully realised and satisfying than Hill's two most recent longer-length ghost stories. Perfect for Halloween. First line: Night keeps me awake like the sea that makes sailors mind it. No, I'm sorry, I really didn't get this. And I think that's a shame, because I absolutely adored DBC Pierre's Lights Out in Wonderland, and I really hoped this collection of short stories and other writings, punctuated by photography, cartoons and other assorted art, would be more of the same. Unfortunately, it feels like a folder of unfinished drafts of random stuff has been published in the absence of proper material. The dazzling wordplay that characterises Pierre's novels is sadly absent here and some of it, I'm afraid to say, has more than a touch of the Nathan Barleys about it. I quite liked the Virgin Mary narrative, but that was about it. I should stress that this review is of the edition I read - the digital version, on my now-obsolete Kindle, which doesn't have a colour screen and isn't great for looking at photographs or illustrations. I'm sure the physical edition of the book, which is a full-colour, limited edition, coffee-table-sized hardback, is more impressive to behold. Taken on its own merits, though, the writing within is a big disappointment. First line: It seems like there should be some sort of introduction to this. Here is a re-creation of a drawing I did when I was five. Hilarious - properly laugh-out-loud funny. I'd read a number of these stories before on Brosh's website of the same name, but found it easier to read them in book format anyway, so this didn't spoil the experience. The chapters about depression are funny, touching and painfully accurate: the dog and childhood stories (particularly the 'letter to my future self' anecdote that opens the book... and the GOOSE STORY) are just downright hysterical. I'm only giving it 4 stars rather than 5 because it's an extremely quick read - it can't have taken more than an hour for me to finish and I didn't even read it straight through - and I might have felt a bit short-changed had I paid for it rather than receiving the ARC. I would definitely buy this as a gift for someone else, though. Although I really do think the alot should have been included. Have just purchased the Susan Hill book and shall save it for Halloween! I was sold at London, fog and bleak winter storms. It is a shame alot isn't included in Hyperbole and a Half - that's my favourite!